The setting of Bleeding Edge is New York circa 2001 and includes a LOT of specific places and characters with varied ethnic backgrounds, but that was true of IV in California, too. There’s a lot of unexplained Yiddish as well as geek-speak but that’s probably to be expected. And the sentences are their good old beautifully convoluted selves with a wide assortment of detailed cultural references and allusions heavily strewn all around – great stuff – both fun and challenging. The plot: Maxine Tarnow (ex-Loeffler), a semi-divorced New York Jewish-mother with 2 school-age boys is also a private investigator specializing in fraud. Soon after the book opens she wants to snoop on a company called “hashslingrz” which her friend Reg told her about. And another friend, Vyrva (verva? ), mentioned a dot.com company, hwgaahwgh.com, which oddly didn’t crash in 2000 but is apparently closed down now. Themes are as usual with Pynchon, paranoia, reality, power, connections this time played off against high tech of 2001 and 9/11. As usual with Pynchon, there are LOTS of digressions which simply slide in and out of the narrative giving background, tone and texture as well as a few coincidences. Maxi knows a lady named March Kelleher, a local and blog-based anti-hashslingrz activist who is, according to a flier the kids bring home, speaking at school. We’re now touching on some big Mideast/oil/war money connections. Maxine’s sons and her friend’s husband introduce her to the deep web. And it turns out that March is the mother-in-law of Gabriel Ice, the boy-millionaire extraordinaire – or is that master of the evil empire? And Reg is involved in a “deep web” search for info on haslingrz because of his films. Maxine’s friend Heidi’s husband and his partner educate Maxi about the “deep web.” And then there’s Nicholas Windust, a Federal Special Case Officer (according to his business card) has been looking for Maxine. This list does not mean to neglect the Russian mobster Igor, the Venture Capitalist Lester Traipse, an ex-hashlingrz employee, or Shawn, Maxine’s therapist, Vyrva, her good friend or many other characters. The names and tone of Bleeding Edge tell us not to take it seriously and yet – there is an element of serious-as-9/11 reality underlying the all that. A huge chunk of this “reality-truth” stems from the totally accurate references and allusions to culture and its artifacts circa 2001. Also, it’s a righteous cyber-thriller in its own right. One thing which makes this book less than light reading is the usual Pynchonian syntax. Sentences sometimes have to be read two or three times to make the unusual word placement meaningful. 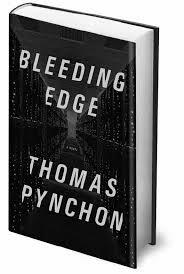 And yes, I will be rereading this – I can only keep track of a certain number of elements or layers at a time and Pynchon, as usual, has several or more.